The hip-hop Monster Like no other is finally returning back home to New Zealand to light up our city. 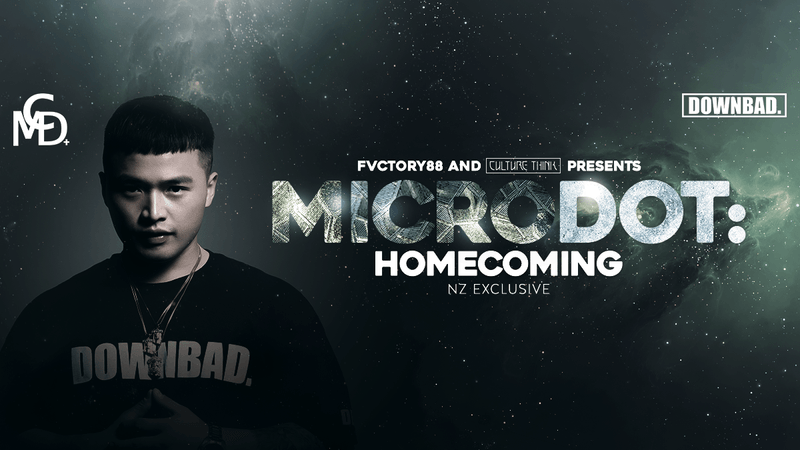 Microdot was born in South Korea but raised in Auckland City since 3 years old. Microdot was first signed at 11 years of age in 2005 and became a historical duo with current leading Hip-hop artist and CEO of Illionaire Records Dok 2. In 2015 Microdot entered the hip-hop TV show called “Show me the Money” season 4 and made it to top 6 out of 7000 people. He has released a lot of chart-topping music such as “Goal Keeper”, "Forrest Gump" with Dok2 which reach Top 15 of all tracks listed in Korea. Microdot is currently very well known of being one of the top performers in the game and is one of the very few if not only Korean/New Zealand Artist to represent New Zealand. In 2015, Microdot was awarded with the Best New Hiphop Artist Award. In 2016 he is still an independent artist working his way to reach his dream of going global nation to nation. He has already sold out in 5 countries and over 12 different cities. Future shows have been confirmed and continuing to process in USA, Japan, Australia, Taiwan, China. Microdot is also the CEO of the popular street wear downbad. which we are lucky to be able to purchase at the Meet & Greet and the night of Microdot's Homecoming Show.